Decorations, lights and fanfare typify the festive celebration of Christmas in the Philippines, even as early as September. On the streets, one can see groups of children and adults alike going from house to house singing Filipino (and even English) Christmas Carols. This is a set of nine day Novena Masses at dawn. The faithful resolutely wake up in the wee hours of the night to present small sacrifices and prayers to Our Lord. Usually celebrated before dawn, it is a Spanish tradition, originally honoring the Blessed Virgin’s Expectation of the Messiah. Food was customarily offered to the needy after the Masses; hence the word aguinaldo meaning “gift” in Spanish. i. Perhaps the most memorable scene of all is the long procession of the parol, which floods the streets with bright colors, and reminds those present of the coming of the Savior to earth. The parol has a rich history that spans centuries of development and perfection. 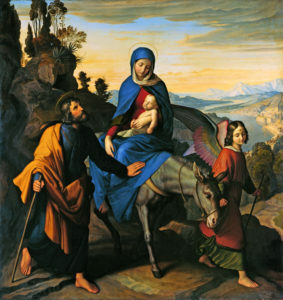 Spanish) announced the arrival of Our Lord’s Nativity. Filipino Christmas would not be the same without this humble yet radiant display outside of houses and in the streets, presented from people from all walks of society. Its roots come from the concept of the Mexican piñata which came to the Philippines when Spain gave the Catholic Faith to the country in the 16th century.ii. 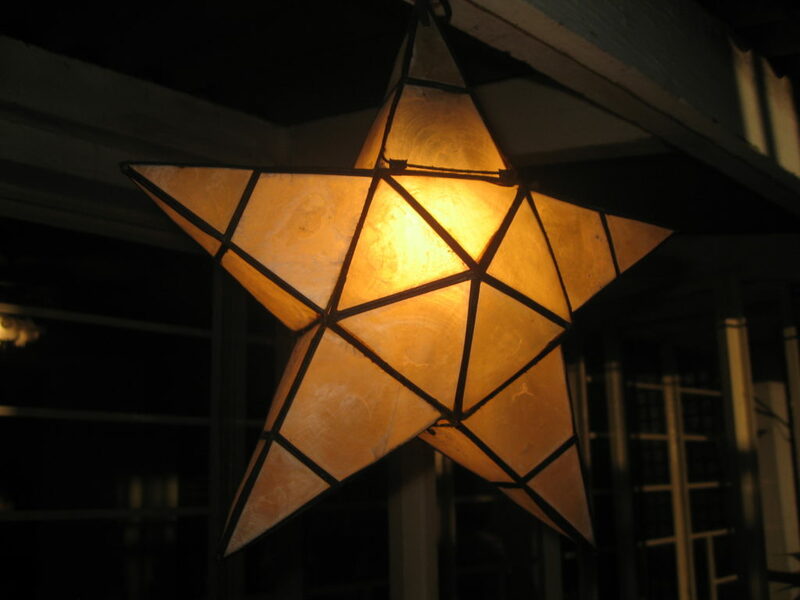 The parol had a two-fold purpose. It first served the practical purpose of giving light so that the faithful could make their way to the Simbang Gabi. More importantly, it was a devotional offering to the Child Jesus, the Light of the world. After the Novena Mass, the parol was proudly hung outside the window of the faithful.iii. Over time, the construction of the parols began to undergo a change. The first lanterns had a humble beginning, created from the local material available to the Filipinos: bamboo sticks, crepe or Japanese rice paper; these were lighted with simple candles or coconut oil lamps. New variations started to appear with the incentive of the Spanish priests. Refined material, like transparent shells, slowly took the place of paper. This brought with it many advantages. The shells could be dyed into a variety of colors, and the shape of the lamp could be tailored to resemble the Star of the East. With each successive year, the size of the stars started to increase. Soon, friendly competitions were encouraged on a local basis to create the most beautiful parol to the Divine Child. The result: churches began an annual display of new designs and better craftsmanship, distinct to the various localities. 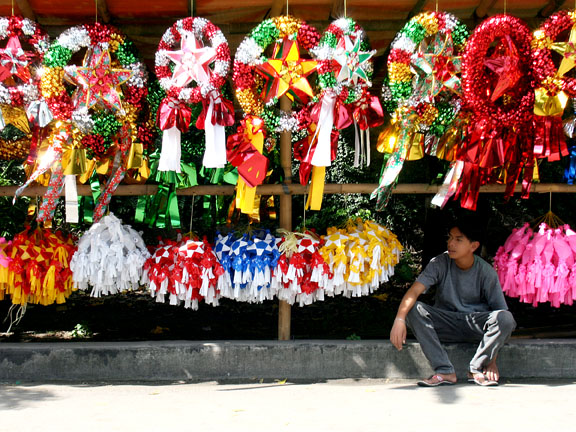 This can still be seen in regions like Pampanga, where the Lubenas Festival is held every year.iv The festival was originally created to showcase the parols in procession from different barrios, or neighborhoods, and were brought to the parish church on the Night of Christmas Eve led by the barrio patrons. As the lanterns grew bigger and became more intricate, the local people contributed to the creation of the parols of their specific barrios.v. Thus the harmonious cooperation between the local people and the patrons of the barrios can be seen in the humble parol, initiating a Catholic tradition that spans centuries in the Philippines. Each parol was characteristic of its respective barrio. Each was unique. Yet all were united under the hearth of Christmas, whose traditions blossomed from the rich and vibrant garden of the Catholic Church. The parol is not some archaic, irrelevant artifact dug out from the coffers of time, offered as a remote antique. On the contrary, it continues as an animating and living custom to the Filipino, effectively preserving the spirit of the first Christmas. 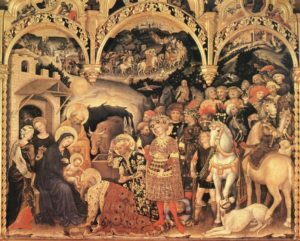 It is at once a perfect gift to the Lord of lords and an innocent and tender reflection of the Wisdom of the Incarnate Word amid the corrosive moral decadence of the modern world. Being an authentic tradition, the parol links each new generation to the Catholic heritage of the Philippines. The Christmas parol is not merely a beautiful aspect of the holiday, but reflects the very important role the Philippines have as a Christian nation. The Philippines is like the Star of the East that beckoned the Wise Men to the King of kings. The country shines as a guide to bring those in darkness out of the chains of the pagan world to the radiant light of the Faith brought by Our Lord Jesus Christ. This was certainly the sentiment of Pope Pius XII, who praised the island as “the herald of the Gospel between two oceans.”viii. After more than 400 years of Roman Catholic tradition, the Filipinos unite to form the 3rd largest Roman Catholic nation in the world, and largest Roman Catholic Nation in Asia, effectively serving as a paladin of light and truth to the corrupt world surrounding them. However, we should not put down our guard. Like all the prophets of old, the Star of the East was also neglected. Impious men unscrupulously rejected and pushed aside the sign as if it never existed. This is not unlike the modern “learned” men in our times, whose goal is to discredit the existence of God. Not that the light of the Eastern Star was lacking in brilliance. Rather, the stubborn eyes of men refused to discern its importance. Thus was the condition of mankind at that time, and so is contemporary man. And yet, such blindness need not only apply to outside nations. Could those in the Philippines be unaware of the influence they posses and the duties attached to it? I turn now to my fellow inhabitants. We Filipinos must ask ourselves: are we loyal to our vocation to guide the gentiles? I cannot simply point to those neo-pagan atheists who swamp the earth with their indifference. Regrettably, I must refer also to those of us who knew Christ, but have descended down to a depth much lower than that in which we found ourselves before the faith; those who have implicitly rejected Him and His Church by going about life as if He does not exist. How could those that are the light be so immune to the brilliance they posses? It is true that the ground we stand on is comparatively firm when we look at other countries. Nevertheless, there continues to be a greater diluting of family values and of Catholic doctrine in society. This comes from an increase of impure and immoral practices, some of which have received “legal” sanction. With this, Filipinos must be reminded of the authentic spirit that should animate our traditions and our families. We should certainly not despair, nor hide our light under a bushel (Matt. 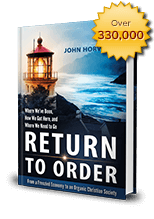 5 : 15) out of shame; at the same time, we need to correct our conduct if we are to steer others to the right harbor. Like the rest of the world, we are surrounded on all sides by raging tempests and uncertainties. These impede our sight and landing on that safe destination, Our Lord Jesus Christ. In the midst of all of this, there is serious danger that we will lose sight of the light of the day that guided us. 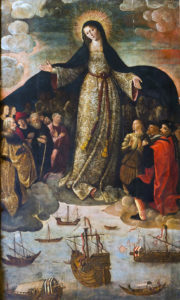 It is in such dark circumstances that we must turn to the guiding Star of the Sea: the Blessed Virgin. We should pray to our Mother to intercede for us. We should have confidence in her maternal concern for us. Above all, we should honor her by imitating her life and virtues. In this way, we will remove the blinding log from our eyes, and be able to see and communicate the salutatory light to those around us. Then, led by the Star of the Sea, we will continue to shine as the Star of the East. Like the parol, our light will beam brightly between the two oceans, bringing men to the fold of the unfathomable mystery of the Divine Infant’s Majesty. May the glory of His triumph over the enemies of Holy Mother Church hasten the arrival of His kingdom on Earth. i. 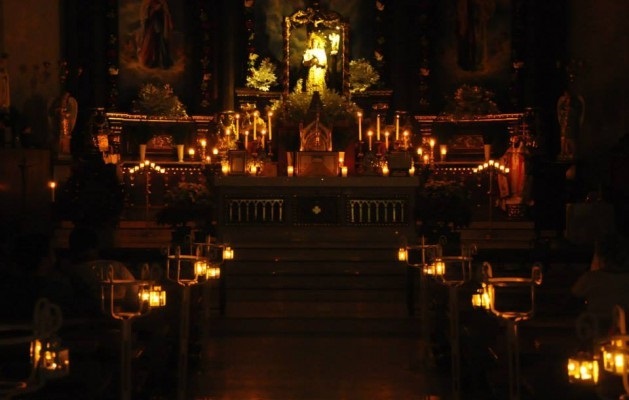 Where did Simbang Gabi come from? This entry was posted in Featured and tagged Christmas, Christmas spirit, organic Christian society, Parol, Philippines, tradition by Marc Vargas. Bookmark the permalink.